Stirring Trouble Internationally: A Second Chance For Kerry But Is Obama’s Second Choice Second Rate? A Second Chance For Kerry But Is Obama’s Second Choice Second Rate? John Kerry is ambitious. 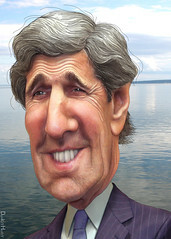 Will he ever make President?Jan Weatherhead writes from Washington: Senator John Kerry is President Obama’s choice to replace Hillary Rodham Clinton and so could become the 68th US Secretary of State. Jan points out Kerry living in America originally wanted the UN Permanent Representative position to replace Susan Rice but has been nominated for US Secretary of State instead. According to our records Kerry wanted the State Department job four years ago. Benjamin Netanyahu in Israel trusts John Kerry from the United States which is important, trust in the Middle East is very important, go over to Stirring Trouble Internationally and find out why? Of his close relationship with Bashar Al Assad. Originally posted over on Stirring Trouble Internationally in the category 'Living In America' Find out more about Barack Obama, Benjamin Netanyahu, Hillary Clinton, Hillary Rodham Clinton and John Kerry. Kerry has been appointed by Obama as Secretary of State in the United States. President Morsi Gauntlet Who Will Blink First?